Back in July, I was finishing a meal at my favourite restaurant - you've guessed it - Nutters - with my brother in law, when Andrew asked us to join him at the bar as service had finished. Aside from being beyond full and perhaps slightly tipsy, we agreed and joined him. 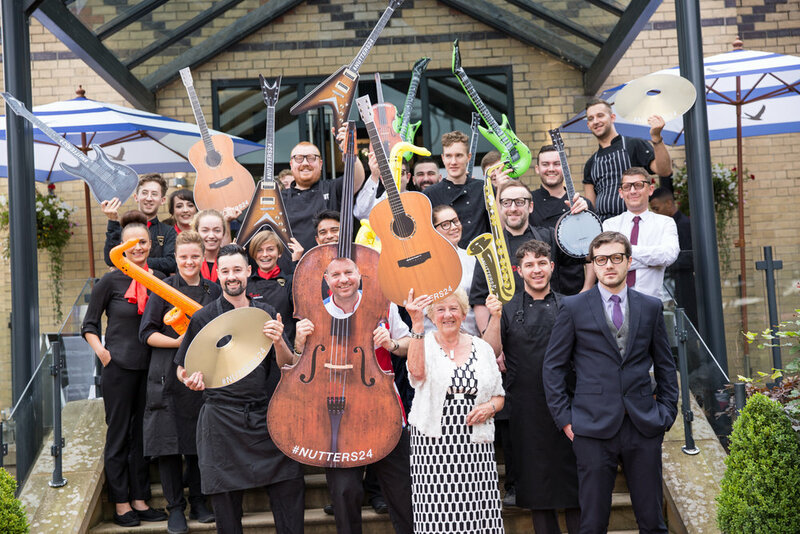 The team at Nutter's Restaurant take the birthday celebrations seriously and in this case, the first one since Rodney, his Father passed away. So it was an honour to have been asked. During conversation he dropped in casually that he would like me to cover the 24th birthday celebrations on the Saturday evening. Obviously I said yes! Fast forward to the big night and I rock up all suited and booted and crack on photographing the guests arriving and enjoying their aperitifs. As everyone was sitting down to enjoy the meal I was ushered to Andrew's guest table - where I was seated with Aiden Byrne of Manchester House fame as well as a few of his close friends. What a treat. But I was working so I stayed of the drink and enjoyed the 5 course meal. Wow. Post meal and feeling rather full, I picked up my camera and shot the guests with their musical props in front of a huge back lit background. Tricky when they were a bit tipsy but all good fun. Thanks mate always a pleasure.